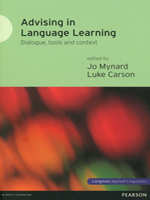 Advising in Language Learning (ALL) brings together examples of advising practice and research from various international contexts in a fast-developing field. A theoretical model based on constructivism and sociocultural theory (the “Dialogue, Tools and Context Model”) is proposed and supported thoughout the book, as each of the contributions focuses on one or more areas of the model. In this volume the editors set out the general aims and understandings of the field, illustrating the innovative manner in which advisors around the world are working with learners and researching the practice of ALL.